Students must attend Religious Education classes for two consecutive years prior to receiving the Sacrament of First Reconciliation. 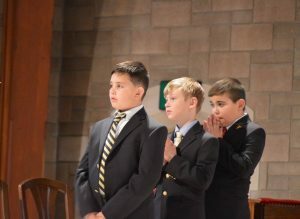 Please Note: To receive the Sacraments in a timely manner with their peers, all students must be continually enrolled in a Catholic School or Religious Education Program since first grade. Please register in person with the Parish Office first. Once registered, please visit our Religious Education Office with the following documentation: Baptismal certificate and if applicable, record of previous Religious Education and Sacraments received. Children (in grade 2-9) will be placed in a grade corresponding to their grade in school, provided they have successfully completed Religious Education classes. Parents should contact our Religious Education Department (203)261-4706.